FOR USE IN SCHOOLS AND LIBRARIES ONLY. 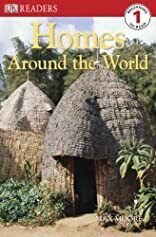 This DK Reader looks at some of the world's most unusual human residences, including pueblos, floating homes, tree houses, portable yurts, and eco-friendly houses. Full color. About Max Moore (Author) : Max Moore is a published author. A published credit of Max Moore is DK Readers: Homes Around the World.